India will press Saudi Arabia and the US, the world's biggest oil producers, this month for a reduction in oil prices to provide relief to fuel consumers, Oil Minister Dharmendra Pradhan said today 9 February 2018. Saudi Oil Minister Khalid A Al-Falih will visit India on February 23-24 while US Energy Secretary Rick Perry would be here between February 28 and March 1, he said. "We feel oil prices should be reduced," Pradhan told reporters here. In meetings with the producers, India, the world's third biggest oil consumer, would make a case for reasonable pricing of crude and reductions from current high levels, he said. 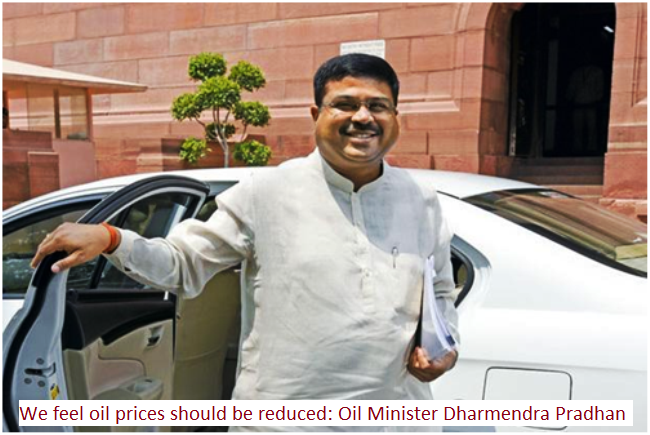 Pradhan was replying to questions as to why the government has not reduced excise duty on petrol and diesel in the Union Budget 2018-19, presented in Parliament last week, to give relief to consumers. Brent crude has lost around 8 per cent in value since reaching a 4-year high to above USD 71 per barrel in late January. It was trading at USD 65.37 today. Asked about former finance Minister P Chidambaram's comments in Rajya Sabha during the Budget debate, he said the government chose to keep the gains arising from falling crude oil prices between late 2014 and early 2016 to provide for funds for free LPG scheme, road and highway construction, education and healthcare. Chidambaram had asked the government what price of crude had it factored in while framing the Budget and if it will raise retail prices or cut excise duty when international prices cross that level. If excise duty are cut, which will be only the second time under Narendra Modi government came to power, the finances will come under severe pressure. Already the government has given a relaxed the fiscal deficit target to accommodate higher spendings. Petrol prices today crossed Rs 73 a litre mark, the highest level since the BJP government came to power in 2014, while diesel touched a record high of Rs 64.15 a litre. Petrol price has risen by over Rs 4 per litre since mid- December, while diesel jumped Rs 5.8 a litre. There were expectations that Jaitley will effect the BJP government's second excise duty cut to ease as his government had between November 2014 and January 2016 raised excise duty on petrol and diesel on nine occasions to take away gains arising from plummeting global oil prices. In all, duty on petrol was hiked by Rs 11.77 per litre and that on diesel by 13.47 a litre in those 15 months, which helped the government's excise mop-up to more than double to Rs 2,42,000 crore in 2016-17 from Rs 99,000 crore in 2014-15. In return, it cut excise duty by Rs 2 per litre in October 2017, but rates have now way above the levels of last year which had led to the duty cut.